These can be translated as "if" (according to Soncino, "or" according to Steinsaltz), "perhaps", "but, rather", and "because". However, there are other possible meanings as well. For further discussion, see (the very long) Rashi here, as well as Tosfot. What I want to focus on today is ki as an "intensifier or asseverative" as discussed in this article by Prof. James Kugel. This sense appears with the prefix ha as hachi הכי once in last week's parasha (Toldot) and once in this week's (Vayetze). In Bereshit 27:36, Esav says וַיֹּאמֶר הֲכִי קָרָא שְׁמוֹ יַעֲקֹב . According to Rashi , hachi is an incredulous question - "Is he not rightly called Yaakov?". However, Ibn Ezra here says that hachi means "truly" - "He is truly called Yaakov". Radak says it is the "ha" that gives it the sense of "truly". Based on his commentary here, Rashi would translate the verse as "Is it because you are my brother that you should work for me without charge? ", for hachi is, according to him, interrogative. But other commentaries (Radak, Rabbeinu Bachye based on Onkelos) say that hachi shouldn't be viewed as a question, but as an affirmation: "Since you are my brother, why should you serve me for nothing?" Both interpretations still connect ki, or particularly hachi, to the sense of a superlative - either as "Are you truly?" or "You are truly". Today in Hebrew, hachi means "most" - as in הכי טוב hachi tov - "the best". 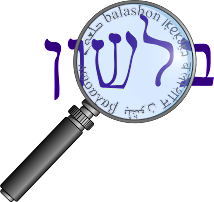 Even Shoshan claims it belongs to Modern Hebrew, and it is considered to be less formal than another word meaning "most" - ביותר - b'yoter. However, from what I can tell, the use of hachi precedes that of b'yoter. We find in Shmuel II 23:19 the phrase מִן-הַשְּׁלֹשָׁה הֲכִי נִכְבָּד . Based on our previous understanding of hachi, we can translate it as "He was truly honorable among the three". But most translations have it as "He was the most honorable of the three" - and the meaning really doesn't change with the adjustment in translation. While I was able to see the early uses of b'yoter (it seems to be first seen in the Gemara, but not the Mishna), I couldn't really do a similar search for hachi - since it is a very commonly used word in Aramaic. Hachi (or hachei according to Klein) in Aramaic means "so, thus" and according to Jastrow and Klein is a combination of the Aramaic ha הא - this and ki. It is used in such Talmudic phrases as blav hachi בלאו הכי - "without that, in any case", and "in hachi nami" אין הכי נמי - "yes that is the case" (used when conceding a point).